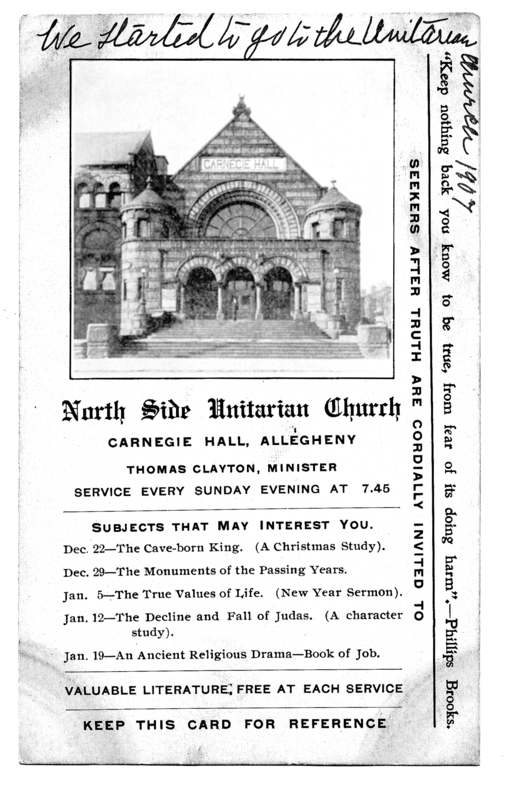 Reverend Thomas Clayton arrived in Allegheny City in 1901 to take up the pastorate of the First Congregational Church. By 1904, he had decided to seek ministerial fellowship with the American Unitarian Association. After submitting his application for Unitarian fellowship, Rev. Clayton began talking with Rev. L. Walter Mason, minister at Pittsburgh’s First Unitarian Church. 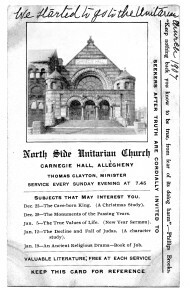 Rather than seek a Unitarian pulpit in another city, Reverend Clayton decided to stay at Allegheny City. During 1905, Rev. Clayton began the planning necessary to organize a Unitarian society there. Working with Rev. Mason, a first meeting was arranged for December 5, 1905. A group of Allegheny residents sympathetic to liberal religion was invited. The meeting was held in Allegheny’s Carnegie Music Hall. During the meeting of January 21, 1906, the group formed a temporary organization, and the name Second Unitarian Church was chosen. A Board of Trustees waselected, including Dr. Robert H. Gilliford as President. On May 6, 1906, Dr. Gilliford called the meeting of the Second Unitarian Church to order and Rev. Charles E. St. John, Secretary of the American Unitarian Association, assured the group that the AUA would support their efforts. A motion was made by Rev. 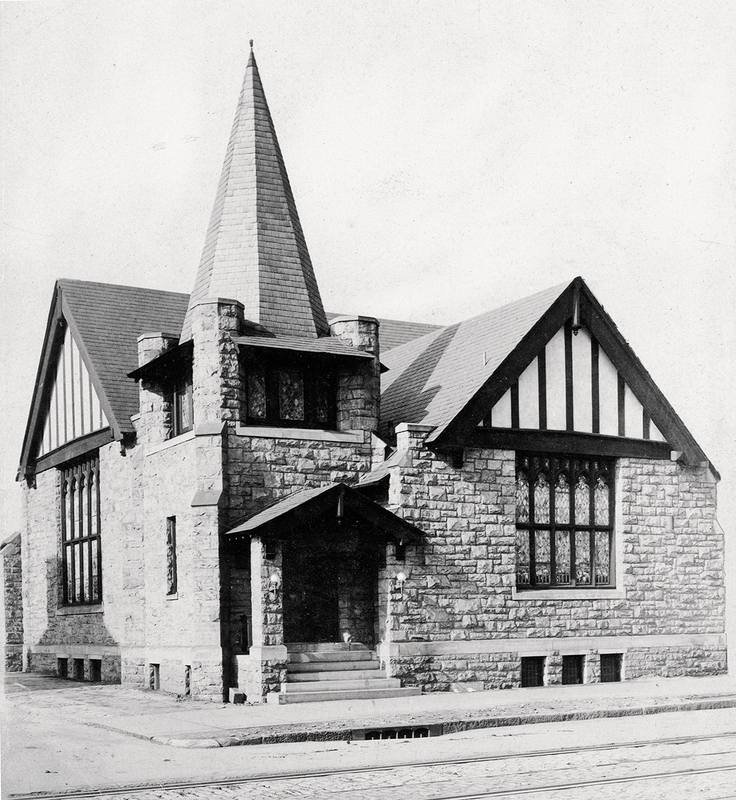 Clayton to make the temporary organization “regular and permanent.” In the spring of 1907, the congregation incorporated in the Commonwealth as the North Side Unitarian Church, and secured the services of architect R. Maurice Trimble to design their new building. Later that same year, Allegheny City, the third-largest city in the state, was annexed by the City of Pittsburgh. 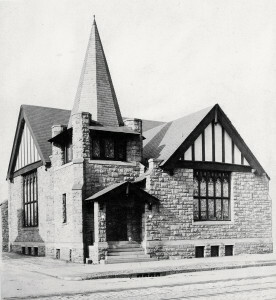 Shortly after the church was dedicated in 1910, Rev. Clayton tendered his resignation, moving to serve new congregations in California. 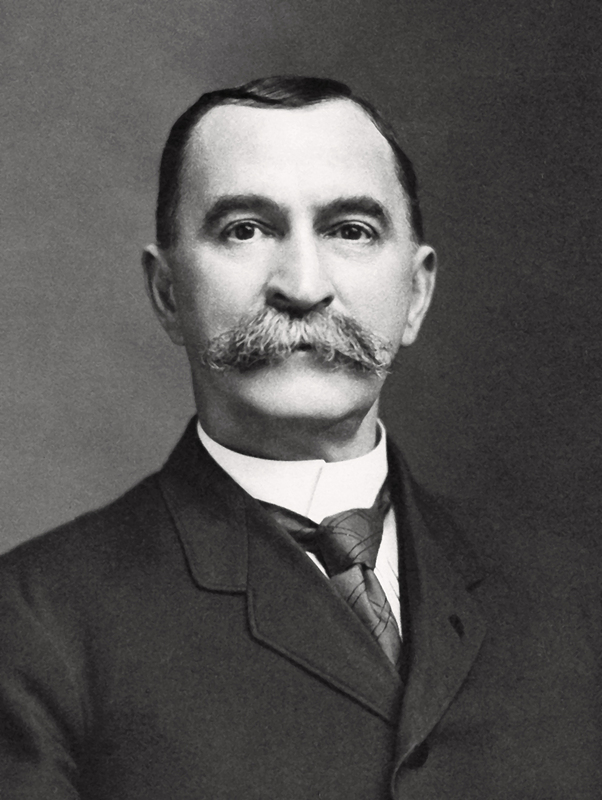 Reverend Charles E. Snyder was called to be minister, and was installed in January 1911. During Rev. Snyder’s ministry, the church was an open forum where the congregation heard from socialists, suffragettes, Theosophists, Spiritualists and many others – all in a spirit of free inquiry. A number of progressive Unitarian ministers spoke from the pulpit as well. It is a testimony to his great abilities that by 1916 the church counted 200 members. Rev. 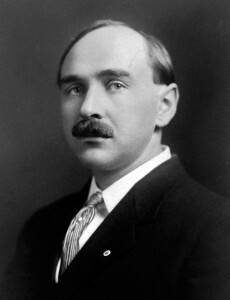 Snyder submitted his resignation in May 1917 to take up the work of the Unitarian Church in Sioux City, Iowa. His last sermon at the church was titled: Comrades of God, Fight On! Fight On!